So it’s Leap Day. To be honest, that doesn’t mean much to me. I mean, I think it’s weird there’s an extra day stuck in the calendar, but I’m not scientific enough to really ponder time and how it effects our lives. Even so, on this Leap Day, I thought I’d post “normal” pictures from our day yesterday on this day that doesn’t even normally exist. This is one of my favorite outfits Cate has worn this winter. I think the sweater is adorable and the jeans are cute and practical. (They’re lined with red fleece!) 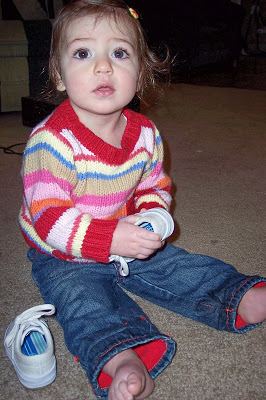 And the shoes … Cate loves her shoes, as much off as on! In the last couple of weeks, Cate has learned to hold her own bottle! She’s still figuring out how to tip it up when she needs to get more. But we’re working on it. 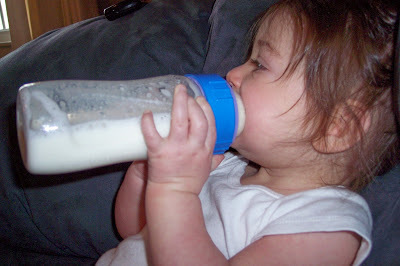 And then once she masters this, we’ll move on to a sippy cup! This is right after a nap. I just wanted you to see the cute face that greets me when I open the door. And those rosy cheeks! that outfit is adorable! 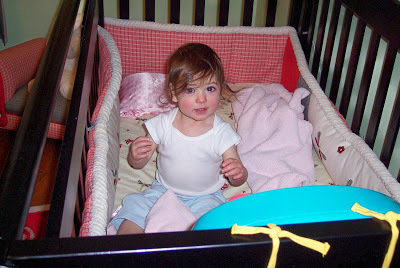 she looks so cute in her crib. so big!